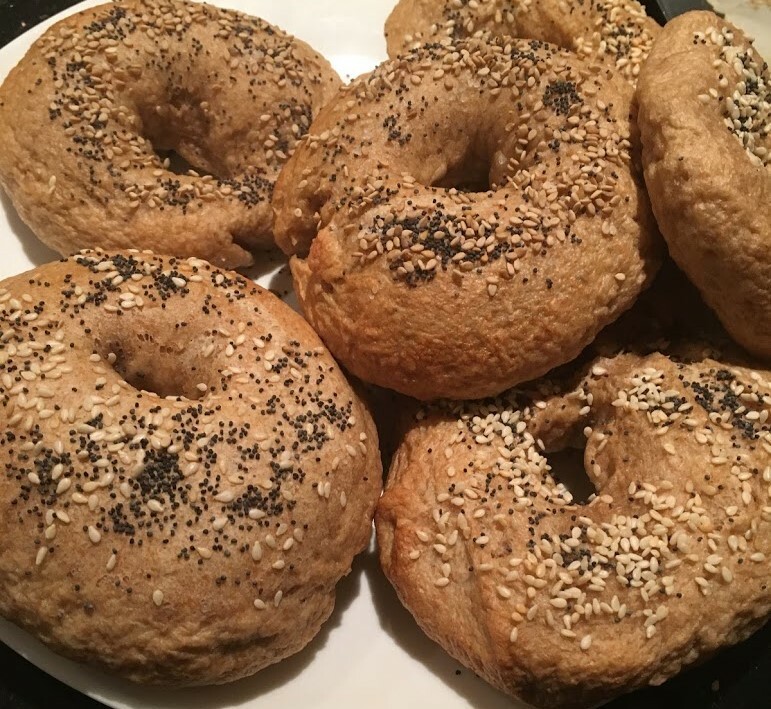 Even if homemade bagels weren’t so delicious, they’d be worth making for the experience alone. They’re an especially fun project for kids. 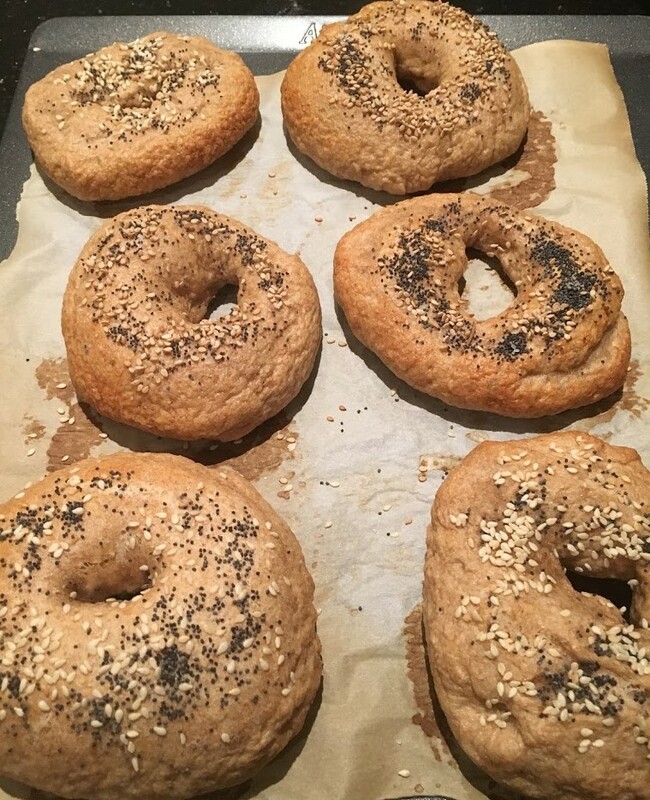 I taught a group of elementary school students how to make bagels once, and they delighted in shaping dough by spinning it around their thumbs, cooking the bagels in simmering water, and sprinkling the tops with poppy and sesame seeds. While the bagels baked, we discussed the history of these chewy, ring-shaped rolls. Jewish immigrants from Poland brought bagels to New York at the turn of the 20th century, and launched a thriving industry. United under a powerful union, Bagel Bakers Local 338, artisan bagel bakers went on strike a couple of times in the 1950s and 60s, shutting down dozens of bakeries. Union members managed to get much of what they wanted – including pay raises and three weeks’ annual vacation time. Though New York bagels are often still associated with their Eastern European Jewish roots, they do cross ethnic lines. In 2011, two Pakistani immigrants in Coney Island discovered that a beloved neighborhood bagel shop was closing, so they purchased the kosher shop from its Jewish owner to save it from going out of business! When their charmingly imperfect creations emerged from the oven, my students marveled at the fact that they actually made their own bagels. I’ll admit, that same thought crosses my mind every time I make a batch of these at home. The original recipe calls for active dry yeast. I substituted instant yeast; I find this produces a fluffier, lighter bread dough. I’m always averse to buying ingredients I’ll rarely use, and lazy about buying ingredients in general. So I substituted brown sugar for the more traditional malt syrup. The results were good, but for that distinct bagel-y flavor, it’s worth purchasing malt syrup. The directions below are for mixing the dough by hand. For instructions on using a mixer, see original recipe. Prepare the dough: Place lukewarm water in a large mixing bowl. Sprinkle on yeast, and stir gently to dissolve. Add flour, salt, malt syrup, and sugar and mix with a wooden spoon until a dough comes together. Turn dough onto a lightly floured surface, and knead until elastic, smooth, and no longer sticky. Return dough to bowl and cover with a damp towel. Let rise in a warm spot, about 20 minutes, until dough is puffy and springs back when touched. Heat oven to 425°F. Place rack in the middle of the oven. Method One: Roll each piece into a ball and flatten into a disk. Poke a hole in the center with your thumb and twirl around your thumb until a quarter-size hole forms. Method Two: Roll each piece into a 9-inch-long rope. Moisten the ends with water. Create a circle, overlapping the ends by about 1 inch. Press ends to join, creating a hole in the middle of the bagel around the size of a quarter. Cover the bagels with a damp towel and set aside to rest for 10 minutes. Boil the bagels: Fill a large, wide pan with water, and bring to a boil over high heat. Reduce to medium low and let simmer. Keep pan covered. Line a baking sheet with parchment paper greased with oil. On a second baking tray, place a cooling rack for the bagels to sit on after they have boiled, so excess water can drain. When dough has finished resting, stretch out the bagels (the holes may have shrunk as the dough continued to rise.) Place 3 or 4 bagels at a time in the simmering water. Make sure they all have room to float around. Cook for about 30 seconds on each side, increasing heat as necessary to ensure water stays at a simmer, until the bagels appear wrinkled. Boiling the bagels helps them develop a nice crust. But don’t cook them too long, or there will be too much crust and the bagels won’t rise properly in the oven. Add toppings: In a small bowl, prepare the egg wash: use a fork to whisk egg white and remaining tablespoon of water until thoroughly combined. Brush the egg wash over the bagels using a pastry brush, then sprinkle with poppy seeds, sesame seeds, or salt. Place the bagels on the parchment-lined baking sheet about an inch apart. Bake: Bake for 15 minutes and then rotate the pan. Bake for another 10 minutes or so, until the bagels are a rich brown color and form a crust both on the bottom and top. Remove from baking tray to a cooling rack, and let the bagels cool for at least 30 minutes. Don’t be tempted to eat them right away; they will continue cooking as they cool.